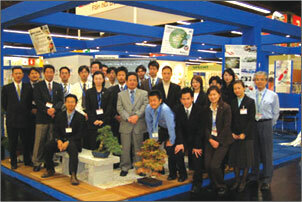 Hikari has participated in Interzoo 2004, one of the world biggest international pet products fair at Germany, in 2004. Our blue and white image color is so popular and familiar now, there were full of fish lovers in Hikari booth who want to know more about the "premium grade diets". Our famous koi diets varieties. Saki-Hikari, the revolutionary koi diets, are so famous in European countries as well as Japan, many customers have asked it for their beloved koi. At the “Japanese Garden Corner”, the koi breeding story of our Yamasaki Koi Farm was shown on 50 inch TV monitor, there were always bunch of koi hobbyists. 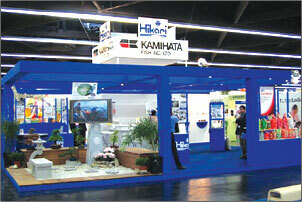 Staffs from Kamihata Fish Industries Group, we all enjoyed this big show!